Notes: This film, produced by the British Pathé Films and released on DVD by MGM in the United States, is among one of the more critically-reviled versions of the story. Despite an all-star voice cast, including Nicolas Cage, Jane Horrocks, Michael Gambon and Kate Winslet (who also sang the film’s theme “What If?”), it got lousy reviews in its theatrical release overseas and was largely ignored in America. 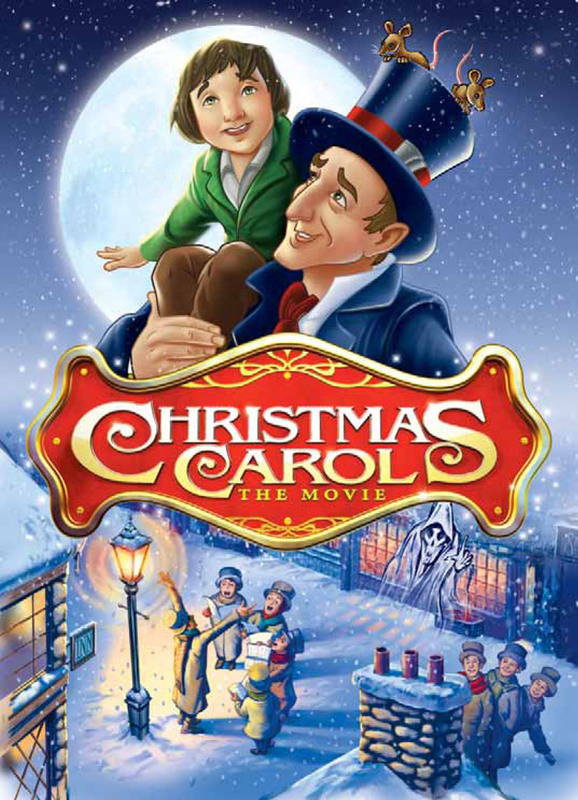 But you know, you’ve gotta give the filmmakers credit for having the audacity to give this production the title Christmas Carol: The Movie, as if all the dozens of other versions that came beforehand weren’t actually movies at all, but rather live performances, interpretive dances, brands of licensed underwear or dried fruit snacks… anything but “a movie.” Really. Thoughts: Although some releases of this movie feature a live-action bookend with Simon Callow as Dickens reading his book to a group of children, the DVD release I have cuts straight to the animation, which looks like it was done by a better-than-average Flash artist. (Which is to say: it’s still pretty bad.) But rather than starting with Scrooge or Marley or… y’know… anything recognizable, things kick off with Dr. Lambert (Arthur Cox) being arrested for his debts and leaving his wards – an entire hospital of what I have to assume are orphans – without any hope, as Lambert’s debt has been transferred to the offices of Scrooge & Marley. As it turns out, the woman left in charge of the orphans (Kate Winslet) is Belle, an old acquaintance of Ebenezer Scrooge (Simon Callow again). She writes a personal letter pleading for mercy, which she delivers to an uncharacteristically unsympathetic Bob Cratchit (Rhys Ifans). It takes almost 15 minutes (in a movie that lasts 77) before we get to something that resembles the Dickens novel, as Fred (Iain Jones) shows up to beg his uncle to come to Christmas Dinner. The Fred design here is awful – ragged and wearing a thin cap, looking more like a waif out of Oliver Twist than Scrooge’s fairly well-off nephew. Then we watch mice play in a bucket. Why are we watching mice play in a bucket? I have no flippin’ clue what Kroon and Llewellyn were trying to do with this script. If I didn’t know this was a British production, I would think this was the result of Hollywood filmmaking-by-committee. Some yutz in a boardroom says he doesn’t get the story or he thinks it needs more of a hook so the audience can relate to the characters or some other stupid comment that makes you think he knows better than Charles Dickens how to tell this story, and the next thing we know we’ve got an entire hospital full of kids about to freeze to death and a couple of mice sidekicks. Then, just to make Scrooge a little more evil and to make the stakes in the story a little more personal, Scrooge dumps the bucket of water out the window right on Tiny Tim’s head, in the freezing cold. You can probably guess where this is going. –why in the hell are the charity workers showing up after Marley’s ghost? Scrooge’s redemption was supposed to have already begun, having him denying Marley at this point is just stupid. Before everything could be chalked up to Scrooge’s greed, but once he’s already been told he has to change and he keeps rambling on about decreasing the surplus population, he just starts to sounds like an idiot. And why are the mice riding in his pocket? Dear God, they’re going to subject us to those things for the entire movie, aren’t they? Anyway, off to the Cratchit house, where Tim (who doesn’t appear to be crippled in this version) is exhibiting the Cough of Death, no doubt because Scrooge himself doused the kid with water, because it wasn’t enough that he was just neglectful. Nope, he had to actively murder the child. We’re 26 minutes in and I hate everyone involved with this movie. Back in his room, the same Ebenezer Scrooge that just fatally soaked a little boy and callously refused to give money to the poor finds the mice in his pocket and cheerfully agrees to share his gruel with them, because the writers of this movie tore the page of their dictionary with “characterization” on it out when they ran out of toilet paper one day. Just as he’s nodding off, Jane Horrocks shows up as a Candle-like Christmas Past that fluctuates inexplicably between a child and a ghoulish old woman. We go from there to Schoolhouse Scrooge on the day his sister picked him up from school and introduces him to her best friend: Belle! Because nobody would believe it if he met her at Fezziwig’s like in every other version of the story. I feel like I need to say something here: I’m not opposed to minor changes in the story in principle. If there were no changes from one version to another it would be sheer lunacy to even make another one. But I do insist that those changes make sense or bring something to the story that other versions do not. Having Scrooge meet Belle as a child doesn’t change anything. Having her present to watch his father dress him down doesn’t improve the story. The subplot with the hospital is utterly superfluous to the point Dickens was making about a man’s redemption – if anything it weakens it, because instead of doing good for the sake of goodness, now we have to wonder if Scrooge’s later good deeds all come as a result of him feeling guilty over how he treated Belle or, even worse, holding hopes of some sort of reconciliation with her. And the damn mice. Add. Nothing. And before we leave the past we see the reading of Scrooge’s father’s will, where he gives everything to Scrooge and leaves a pregnant Fan out in the cold and about to die, which Scrooge is perfectly happy to allow to happen. Then, in a move that would make Sheldon Cooper proud, he presents Belle with a “marriage contract” before she walks out on him. This movie strives to make Scrooge and everyone in his world as miserable and heartless as possible, except for when it comes to giving mice food. But by the time Christmas Present shows up we don’t even want Scrooge to be redeemed anymore, we want him to die of typhoid and get buried at the bottom of the river. Michael Gambon is our Christmas Present, and he at least feels true to the character, showing Scrooge his feast and talking about giving it out in the spirit of love. Unfortunately, the filmmakers choose to waste our time showing us the mice eating a pie instead of focusing on the ghost. He flies around, showing off people making merry in a sequence that looks hand-drawn in a way that would actually be kind of charming if the rest of the animation was adequate and therefore serving as a real contrast. Christmas Yet to Come is a similarly poorly-animated apparition, waving his arms around at a rate of four seconds per frame to show Scrooge the aftermath of Tim’s death (which, in case we forgot, Mrs. Cratchit directly attributes to him). Marley shows up to tell Scrooge he’s dead, then he wakes up alive. Ebenezer Scrooge has been redeemed, but as someone forced to watch Christmas Carol: The Movie, I have officially lost all hope. Anyway, because the screenwriters added a completely useless subplot, as the redeemed Scrooge walks around town, Belle weeps over her empty hospital. Scrooge takes the blood money he got for foreclosing on the place and gives it to a homeless guy, because lord knows Belle couldn’t use it at this point, and then starts wandering the city aimlessly. When he gets home, Belle shows up and chews him out for closing the place down. He begs forgiveness from her and she tells him it’s not too late, which of course begs the question of why she was just dressing him down instead of asking him for help. Dr. Lambert is let out of prison and sent to treat Tiny Tim, Bob Cratchit gets his raise, the damn mice ride around on Scrooge’s shoulder and I resist the urge to club a puppy over the head. The end. The good news is that, thanks to this film, An All Dogs Christmas Carol only had to keep the title of “worst adaptation” for a mere three years. The bad news is that this version even exists. I used to think the worst thing a version of A Christmas Carol could be was forgettable. Now I’m afraid I’m going to remember this one because of how stupidly bad it actually is.